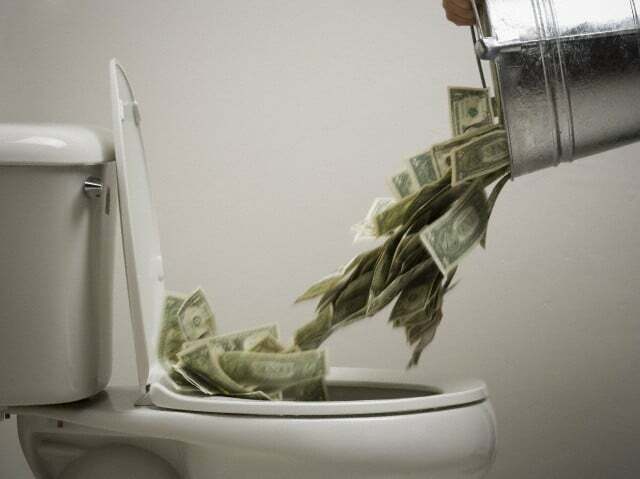 How many times has an indicator signaled you into a bad trade, or even prevented you from entering a good trade? If you are familiar with the way I trade, or are familiar with some of the content on the site, you will know that I am not a very big fan of common Forex indicators – in fact, I advise against using them at all. I know this is a sensitive, and maybe a little of a controversial subject among the trading community. I am not here to attack anyone who chooses to use them, I am sure in rare cases some traders may have reached a level of harmony with having an indicator or two on their Forex charts. This lesson is focused on the other 99.9% of traders who are constantly being let down by Forex indicators! Today we’re going to have a look why Forex indicators are such a disappointment, and potentially destroying your chances of success. If you’re new to Forex trading, then this warning is a must read for you. There are sharks out there, no not your broker, I am talking about the internet marketers who try to exploit your ‘get rich quick’ emotions. 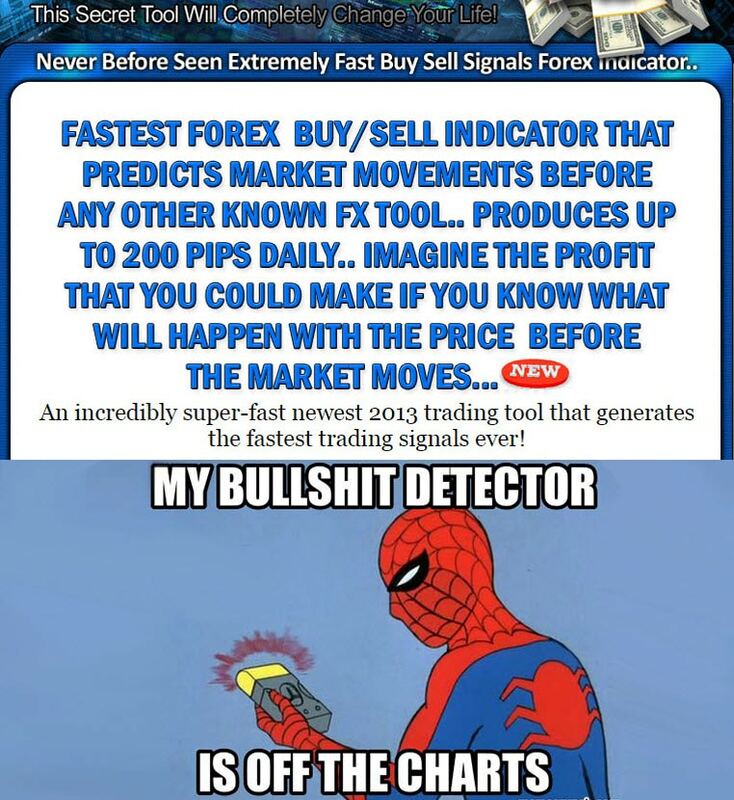 Internet marketers LOVE Forex indicators – because they are an easy ‘shiny new object’ that will sell to the newbie trader. These guys will use a combination of clever words and photo shopped images to convince you that you’re buying into some ‘secret’ propriety system that the “banks themselves even use” – just switch it on and ‘watch the money roll in’. Price tags usually range from $40-$90. I don’t know about you, but if I invented an indicator that could turn me into a millionaire overnight, I would want more than $90 for it! Forex traders are drawn into the proposed functionality of Forex indicators – ‘buy on green’, ‘sell on red’. These type of indicators exist, but are a giant disappointment – usually just a cheap and hollow product that was cooked up in a programmer’s bedroom overnight. If it sounds too good to be true, it usually is – especially with Forex indicators. Thankfully, many traders know to watch out and avoid these type of sales pitches. It’s always good to have realistic expectations of Forex trading. Traders commonly have an inner urge to make their trading strategy super complicated in an attempt to give them some sort of supreme trading edge in the markets. The reality is complicated leads to complication in Forex world, and Forex indicators are definitely one way to compound complication. You should not be looking to make trading harder for yourself by adding all these extra variables into your system, but rather cut as much as you can out to give yourself a more simplified trading environment where you can enjoy clarity. Forex indicators will ruin the simple nature of plain Forex chart by polluting it with painted lines, graphs, histograms and other exotic waves. Maybe your chart doesn’t look this bad – but you can see my point. Don’t pollute your charts. It is easy for traders using Forex indicators to lose control and pile more indicators in to try mitigate flaws from other indicators. The candlesticks and the price action are the only truly reliable indicator that a trader can work from. Anything else just starts to create layers of noise, complications and conflicts that will make trading decisions more and more difficult. Avoid ending up with a mess like this, do yourself a favor and keep your charts tidy and to the point. Indicator users are generally guilty of ‘over stacking’ – which means loading charts with too many indicators. The chart will looks like a complicated mess that makes it hard to do meaningful technical analysis – creating a very frustrating experience. It’s no secret that indicators are generally a lagging beast in nature, you’ve probably even heard the term ‘lagging indicators’. The inner working parts of Forex Indicators are generally centered around one mathematical formula, or a small algorithm which is designed to scan over the price action, extract the data, pump it through the internal coding, and output the result in a graphical format on your charts. This may be in the form of a line, graph or some other cleverly coded aesthetic feature. When you cut open these indicators and have a look how they are actually generating their results, you can actually start to see why Forex indicators lag behind price so much. Surprisingly, most of them are just glorified moving average calculators, with the expectation of a few ‘bells and whistles’. Inside many of the common Forex indicators, there are multiple layers of moving average calculations that are chained together. The ADX is very guilty of this – it passes its internal data through 3 layers of moving average math. How does this affect the trader? Well, averaging formulas make indicators slow to respond to price movements. 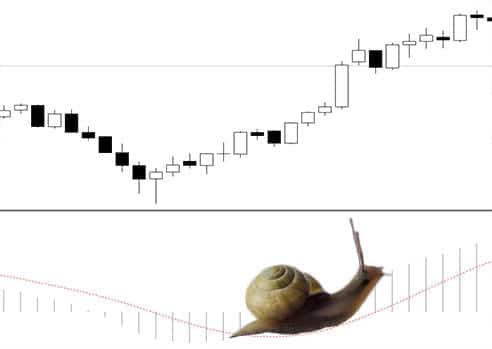 The more averaging that is performed inside the indicator – the slower the reaction time to price movement. For example, if a breakout occurs – most of the price move could be over before an indicator actually signals you to get in! Let me demonstrate what I mean on the charts- I will continue to use the ADX as an example. A simple ADX strategy is to take a trade when the indicator moves and closes above the 20 level. This chart demonstrates how the lagging nature of indicators can really screw you over. The above example shows a breakout that occurred past a resistance level. Our Price Action Protocol system could have gotten you in on this breakout as price breached the highs of the Inside Day. 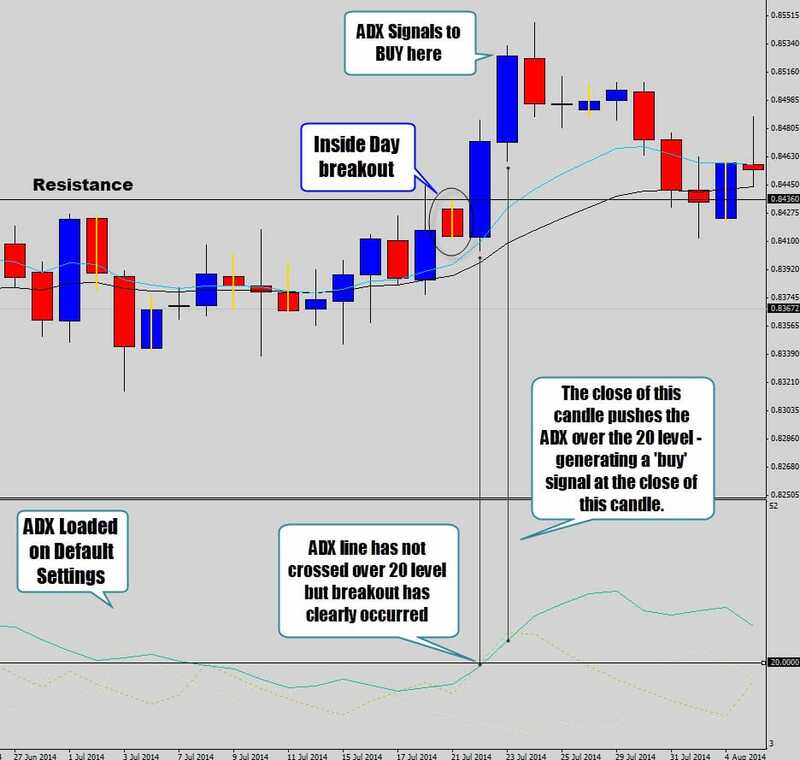 The ADX signals the trader to take action almost at the very top of the move. With today’s volatile markets you need to be able to interpret price movements directly to get you into good moves like this. Sitting back and waiting for an indicator to give you the ‘OK’ to pull the trigger is just not going to cut it. Most indicators are very slow to respond to price movements because they a built on top of a lot of averaging math. This is done to help smooth out noise in the indicators, and ‘filter’ out false signals – but at the cost of some severely lagging response time and performance. 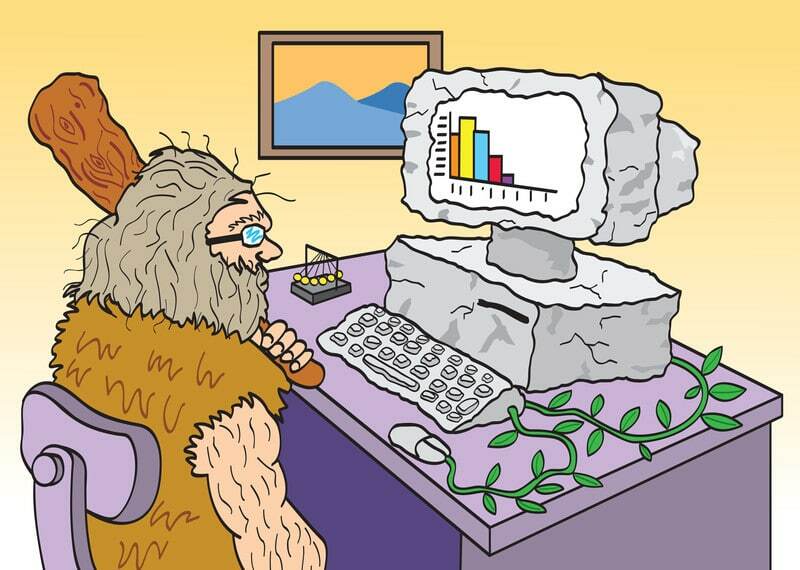 Most of the common indicators you find pre-loaded in your charting software are dinosaurs. They’ve been around almost as long as the first computer – which was invented sometime in the 1960’s. There hasn’t been a new type of indicator design concept (that we’ve seen) in the general public since the creation of electronic trading. As we mentioned before – all of the indicators today use the same mathematical concepts, just reinvented forms of price averages. Markets back in the 1960’s were a different beast – price movements were easier to anticipate, trends were much more stable and volatility was nowhere near as high. These are the conditions that most of the indicators were designed to work with. Today’s markets have changed dramatically since then – Indicators have remained the same, can you start to see the problem? The classic set of indicators made for those nice simple 1960’s markets just don’t copy very well in today’s more intense conditions. Classic indicators were the precursors for today’s more complicated trading algorithms, aka Forex trading robots. The ‘read deal’ complicated algorithms are the ones banks and hedge funds use. These bad boys are comprised of cutting edge technology created by mathematical geniuses and computer scientists – it’s unlikely that you or I will ever be privy to see them. They would be updated regularly to constantly cope with changing market conditions. My point is, the markets have now move beyond the simple programming of common indicators. If you rely on them heavily to help you make trading decisions, you will be trapped in a lot of bad positions. Stop watering a dead flower and focus on the things that matter – like the price itself. Most indicators that newbie traders reach out to were designed in the 1960’s for the markets back then. Since their inception, the markets have changed – the indicators designed in the late 60’s don’t work the they were intended in today’s market environment. Indicators are very ‘narrow’ in design – they perform one function, in one type of market condition, for one specific trading style. In ideal ‘text book’ perfect conditions – indicators will do what they were designed to do. When the market changes behavior and shifts outside the favorable working parameters of the indicator – it fails miserably and starts generating a ton of bad trade signals. 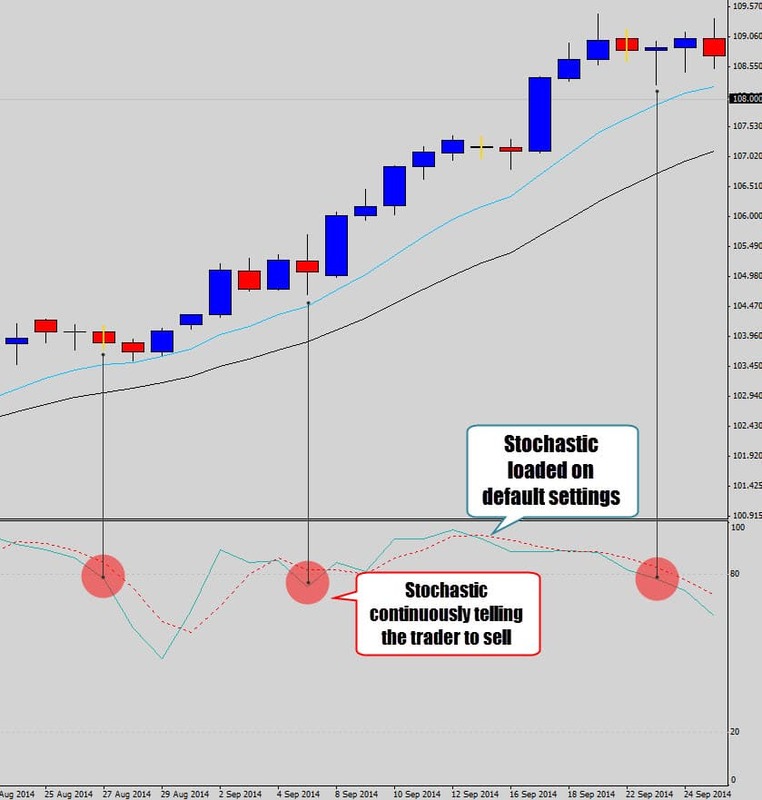 Notice how the Stochastic Indicator keeps signalling the trader to sell this bullish trend. The Stochastic is designed to be an oscillator and only works well inside ‘back and forth’ type movements, like range bound conditions. When trading conditions shift outside the comfort of the stochastic’s ideal working environment – a lot of bad signals are passed to the trader. Traders will attempt to ‘compensate’ for this flaw by adding other indicators to the chart to help ‘filter’ out the bad signals output by one indicator. This sounds really good in theory but doesn’t work out as much as traders anticipate. To really ‘zero in’ and correct this problem further, the indicator trader will add more and more indicators on to the chart in an attempt to filter out more bad trade signals. This is a runaway effect that leaves the trader on the hopeless search for the golden indicator combination and settings. This is called Analysis Paralysis – where there is just so much going on, on the chart that the trader is basically lost is his own analysis and doesn’t even know what he is doing anymore. As I mentioned before you should be looking to simplify your trading – not complicate it! You will be much better off stripping these indicators off your chart and working directly with the price action. Nothing beats the clarity of a nice clean price chart. All you need to do is build the skill of interpreting a plain price chart and ‘read’ the footprint of the market. A nice, simple trend following technique is to trade with an established trend (we’ve all heard this over and over), but use counter-trend corrections to buy on weakness or sell on strength. The above chart shows the USDJPY weakening with downward pressure. Support levels are being broken and the market is trading on the negative side of the mean value (10, 20 EMAs). This is simple chart reading that anyone can do – just keep checking yourself and make sure you’re not looking into things too deeply. 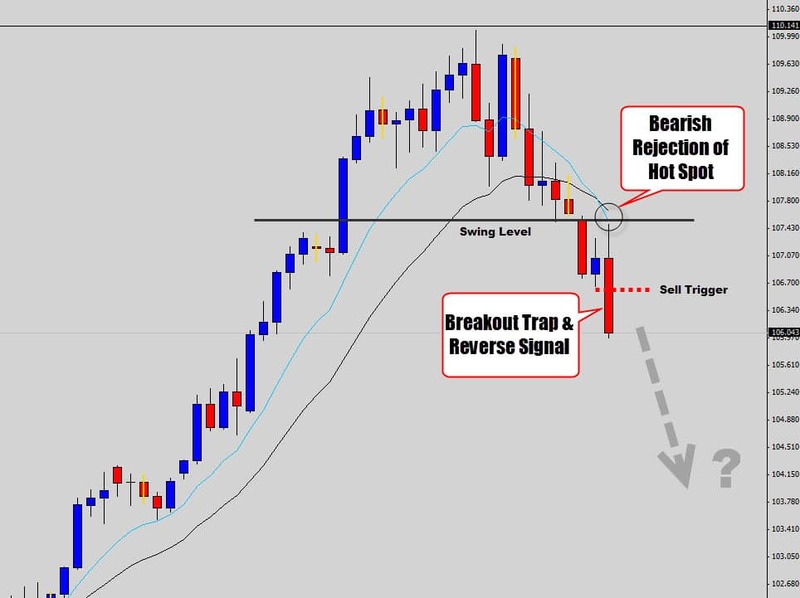 With a downtrend in place, we simply wait for price to retrace into what we call ‘hot spots’ in our Forex course. The market did move up and test the hot spot as anticipated, responding heavily with bearish rejection that session. The initial asia breakout trap, following by an intense sell off – triggered a bearish breakout trap and reverse setup. During the same trading session, the ‘risk free’ target from out split money management model was also triggered – so even if the trade doesn’t work out, no loss will occur. The point is, we didn’t need a crap load of indicators to perform some solid market analysis here – clean, simple, stress free, straight to the point chart reading & trading. Indicators get out of control very quickly as traders stack them on the charts to counter other indicator’s bad signals. In a multiple indicator scenario – they will most likely provide conflicting data, confusing the hell out of the trader. Old school indicators were designed for specialized market conditions, they don’t stack, or work too well with one another. The bottom line solution is to stop relying on indicators to do your market analysis for you – they won’t meet your expectations and you will end up being betrayed by them. The most important indicator you have is what is on a plain chart – that’s right price itself. You need to learn how to trade with price action if you really want to understand what you’re doing as a Forex trader. 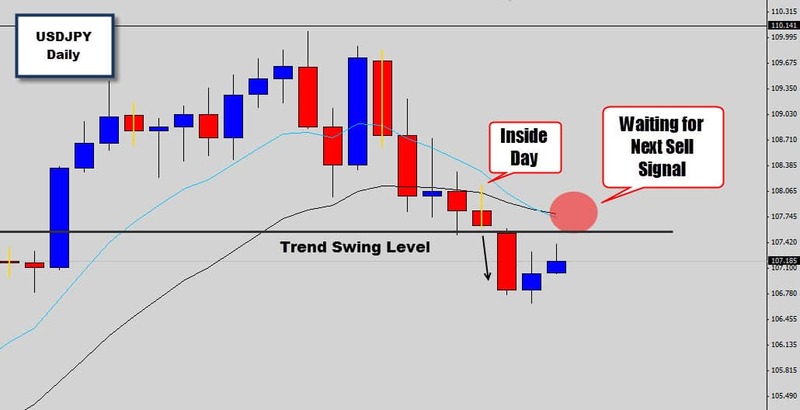 Don’t be intimidated by a plain candlestick chart – once you get started with price action you will wonder how you even managed as a trader without it. 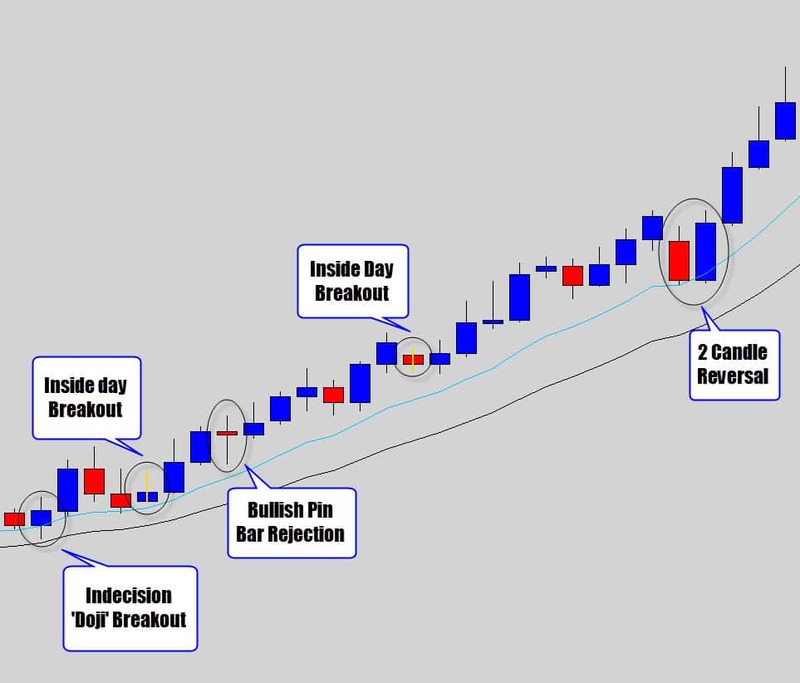 The chart above shows many of the price action signals we use every day inside the war room. These trends are the big money makers for us – because price movement is the direct driver for trade profits. During this phase of the trend, there were 5 potential price action buy signals that could have been taken advantage of. Price action patterns are a much simpler ‘no fuss’ way to approach Forex trading. The most powerful computer known to man is actually the human brain. Your brain has the potential to interpret the information from a candlestick chart much more effectively than an indicator could. If you’re ready to ditch the indicators and make a positive step towards your trading future by learning how to trade with price action, then you might be interested in our Forex Price Action War Room Lifetime Membership – which contains our advanced price action course. Have indicators let you in down? I would love to hear your story in the comment section below! Tell me how indicators have affected your trading, has your trading improved when you started relying on them less? Looking forward to reading your comments below. All the best to your future trading success! I AM VERY GLAD TO READ IT. KNOWING ME WHAT NOT TO DO. THANK YOU VERY MUCH. Sometimes it's a good idea for new traders to try these indicators and see first hand that they don't work - that way you've got it out of your system and aren't tempted to use them in the future. Great post ! I think the style of trade you are encouraging is something that all traders can benefit from. I actually write similar articles for my website. I just finished a good one about day trading that would fit in perfectly with this info. i totally agreed. price action is the key. .simple and easy as the chart dun lie. I once learned thru many errors and mistakes made in trading. 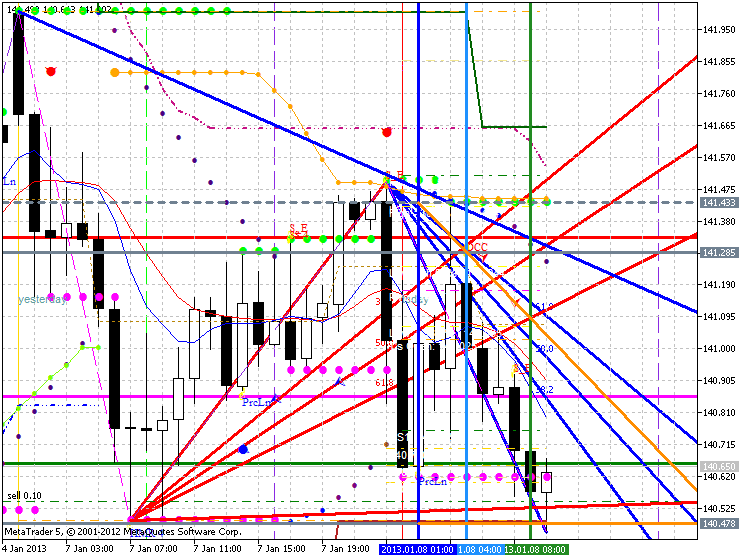 I discover that market is like a religion...GOD knows what happen next. and in this understanding ,i can say ,market is GOD..u never know the next moves coming around. The only holy Gail i learn from my experience is-- Walk with the market. to me ,price action is the key. cheers guy. 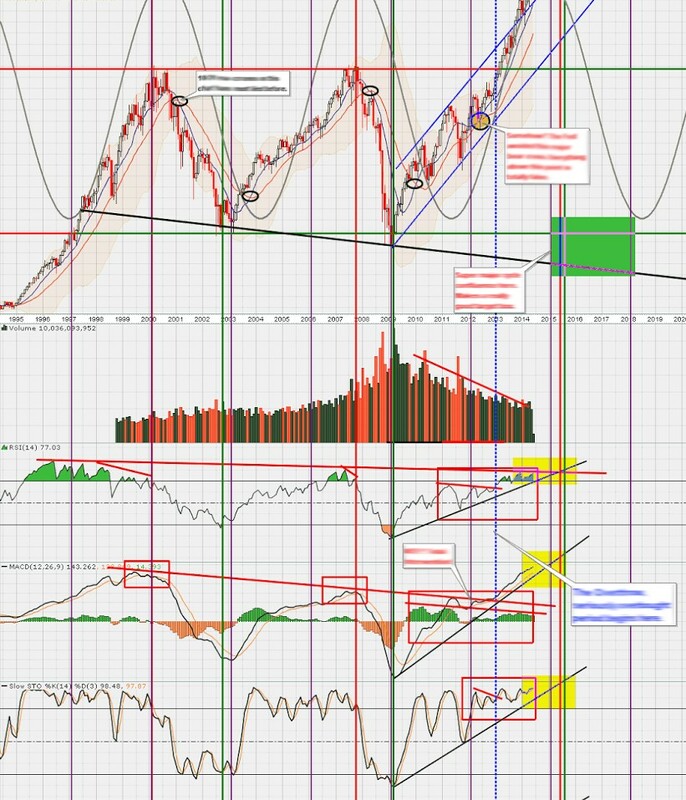 I used them all in the past macd and rsi was my favourite. But now after stripping down my charts I feel so much better.